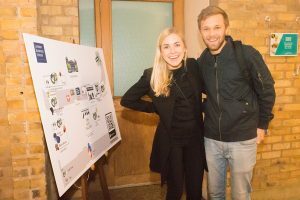 When I was applying to London Business School, the admissions team showed me and fellow applicants a highlight reel of student life. 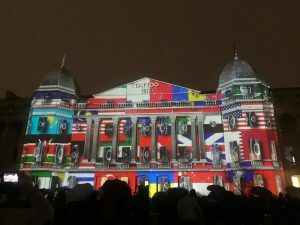 What still stands out in my memory from that video is the clip of “Tattoo”, with its vibrant and colourful lights projected on the front of our iconic building. When I joined the school, I knew I wanted to be part of that event in whatever capacity I could. Low and behold, two years later, I became co-chair of the event. 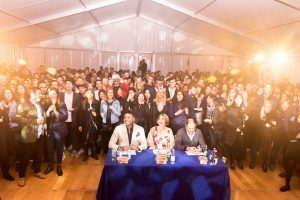 Along with my co-chair and Planning Committee, we got to plan the most memorable night at LBS, not to mention the largest Tattoo in the school’s history. Well, I’d say it’s the biggest and best event on the LBS social calendar! 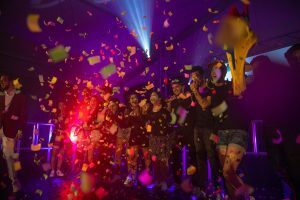 It’s run entirely by students, for students and has been occurring every year for over a decade. It celebrates the vibrant diversity of the student body. More than 40 of our cultural and regional clubs participate and showcase their local foods, beverages and talent. 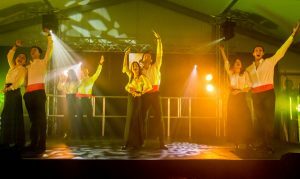 In practice, it’s a global food festival with a plethora of entertainment, including a talent show, silent disco, and band performances. The evening culminates on campus with a light show that has become synonymous with the event. After all that – we keep the party going with an off-site party at a nightclub in the City. 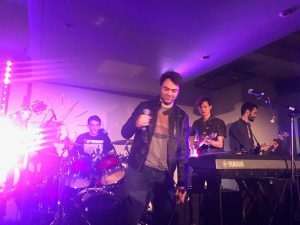 What makes the night so memorable is the commitment and dedication that everyone puts in; there are over 300 students involved – including the Student Association, volunteers and clubs hosting food booths and talent show performances. 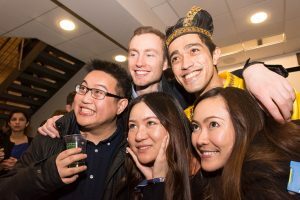 With more than 1,100 students and their friends on campus for the event, the campus is buzzing, the energy is high, and it’s a powerful reminder of #whyiloveLBS. Why is it called Tattoo? No, not because we all get them! The word ‘tattoo’ is derived from the military – it was originally a form of military music, but the practice has evolved into more elaborate shows involving theatrics and musical performances. This year, we were dedicated to making it the first ever plastic-free Tattoo, building on the school’s initiative to eliminate single-use plastic. 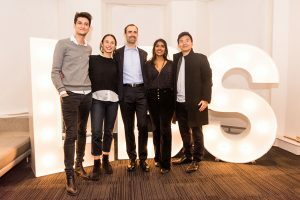 We also worked with the Marketing team to give every guest a t-shirt with the school’s new logo and had Dean François Ortalo-Magné open the talent show with a video launching the new LBS brand. 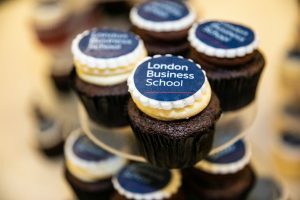 The calibre of both the food and the performances blew people away – with guests calling this the “best night of their LBS programme.” I couldn’t agree more! 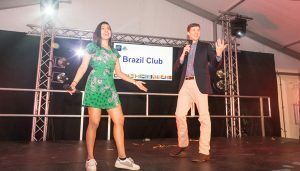 Two of the Talent Show MCs, Trishala Iychettira (MBA2020) and Harrison Froeschke (MiM2019) pumping up the crowd. 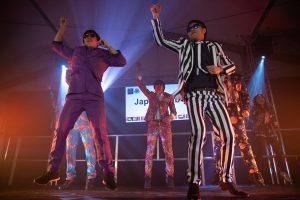 The Japan Club showing off their moves. The LatAm Club celebrating their Talent Show win. Vegan cupcakes with the new logo! 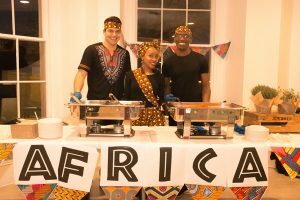 The Africa Club serving Jollof rice with chicken and beef. 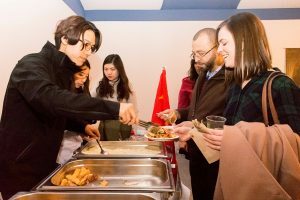 The Central Asia Club serving Hachapuri and Plov. LBS Staffers enjoy Chicken shawarmas from the Middle East Club. 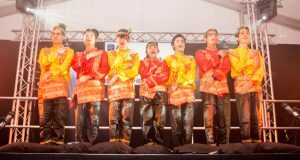 Students celebrate the evening, some in cultural dress. So much to do, so much to see! Students plan out their evening with a map of events. Dean François Ortalo-Magné and students pose in front of LBS lights. Other highlights from the evening included performances by LBS bands (Baker Street Boys pictured). Students enjoyed the Silent Disco and the Light Show. 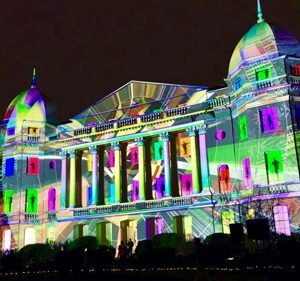 See the fabulous Light Show here.